My writings on and analyses of cricket statistics. In comments, zscore noted that bowlers with few wickets per Test (such as all the players in Samson's top five) were likely to have high average partnerships broken, since part-timers don't bowl often when wickets are falling regularly. You can take this idea a bit further: part-timers are also likely to have a higher average than specialist bowlers. We would expect that the higher the bowling average, the higher the average partnership broken. 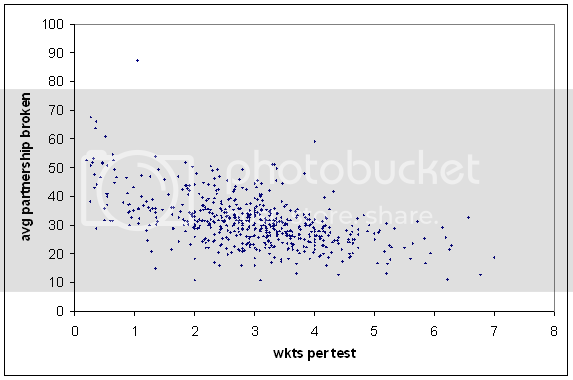 If you plot a graph of this for all bowlers with at least 20 Test wickets, you see a strikingly linear relationship. A quality we would like in a partnership breaker is not just breaking large partnerships, but doing so without conceding many runs. A new method of ranking presents itself: the vertical distance above the regression line in that graph. If you're above the line, it means that the partnerships you break are larger compared to bowlers with your bowling average. The huge and very obvious outlier is Norman Yardley, so he still comes in at number one. The rows after the "----" are the continuation of the table with a qualification of 50 wickets. The figures include all Tests up to Test 1853, and not the just-completed Boxing Day Tests. In particular, Paul Harris has dropped down a lot, as he took a bunch of wickets in the Windies' second innings collapse. Of course we also want to know the other end of the table — who has a really bad average and only breaks small partnerships? Anti-leading the way is the West Indian orthodox bowler Inshan Ali from the 1970's, whose 34 wickets came at 47,68 runs apiece, but whose average partnership broken was just 21,26. He's the only bowler over 20 runs below the regression line. With a qualification of 50 wickets, the worst is Rumesh Ratnayake: an average of 35,11 and an average partnership broken 22,05, putting him 10,88 runs below the regression line. The outlier with 4 wickets per Test and an average partnership broken of 59 is Norman Gordon, who played five Tests just before World War II. In the history of Test cricket, there are nine men whose entire first-class careers comprised Tests. All of these Test careers happened in South Africa against England in the 19th century, with six (two English, four South African) being in the dubiously classified Test series of 1888/9. These early matches weren't classified as Tests at the time, and I don't know when this decision was made (Does anyone here know?). Certainly it was after 1917, when Basil Grieve died. According to his Cricinfo player profile, Wisden's obituary didn't mention him playing Test matches for England. Another one of these Test cricketers was Joe McMaster, whose Cricinfo profile incorrectly states that he "holds a unique place in cricket history in that his only first-class appearance came in a match later designated a Test". In fact, there are four others with this distinction, one of whom (Dicky Richards) played in the same Test as McMaster. If you put a qualification of 10 Tests, the list of players with the highest percentage of first-class matches as Tests is dominated by modern players, whose schedules are crowded with ODI's, and whose tours rarely involve many tour matches. And even when those tour matches are played, they're often not first-class. Of players from a earlier eras, there's Kapil Dev at 47,64%, Frank King at 45,16%, and Dilip Vengsarkar at 44,62%. At the other end of the table is Charlie Parker, who played 635 first-class matches in a career spanning 32 years, and one Test for England in 1921. With a qualification of 10 Tests, Lucky Denton finishes last. He played 741 first-class matches but just 10 Tests, the latter all in the early 1900's. And now onto bowlers who do better in Tests than in other first-class matches. Unlike batsmen, this phenomenon is pretty rare for bowlers with long international careers, and even then the difference in average is pretty small. With a qualification of 50 Test wickets, you get the following table ("others" is the number of other first-class matches). The rows following the "---" continue the table with a qualification of 100 Test wickets. George Lohmann's difference of 3 runs out of 14 looks quite large, but his Test average was helped by his 35 wickets at 5,8 against a weak South African side in 1895/6. Against Australia his average was 13,01, not much below his first-class average. Of the 310 bowlers with 50 or more Test wickets, only 36 have a better average in Tests than in first-class cricket. Compare this with batsmen: of the 308 batsmen with more than 1500 Test runs, 82 have a better average in Tests. Presumably this asymmetry arises in part because a batsman who isn't concentrating so hard (as he may do in a domestic or tour game) is liable to get out early, but a bowler can keep putting the ball on the spot and take wickets. The wet weather early in the English county season (mentioned by damien at CFF) is probably also a factor. Over at CFF, sYed asked about players who have poor domestic records but excellent international records. I've done a search through Test batsmen (qual. 20 innings), and separated their Test average from their average from other first-class cricket. Here are the top twenty improvers from other first-class to Tests. Robertson was unlucky to play only 11 Tests for England (between 1947 and 1952). He was dropped more than once after doing well with the bat. He was dropped in favour of Cyril Washbrook after scoring a century at Lord's, and in his last Test he made a pair of half-centuries, only to be replaced by Reg Simpson for England's next Test. Perhaps the selectors dropped him because of his county form. Tests: 1974 runs at 43,87. Other FC: 19554 runs at 34,67. After a mediocre first five seasons of county cricket, Pullar averaged 55 in first-class cricket in 1959, the season he made his England debut. He had good success, averaging over 50 in his first 22 Tests. But in 1962 his form waned, both at Test and first-class level. He was dropped from England after 28 Tests, and he never re-found the same consistent form of those few good years. It's surprising to see Sutcliffe's relatively poor record for Yorkshire — an average of only 50,2. But he had five seasons of county cricket before making his England debut, and in those years he never averaged more than 47, and indeed he averaged only 30,12 in 1921. He also played four seasons after his last Test, by which time he was past his prime. With an average of 55, it's surprising that Tyldesley didn't play more than his 14 Tests for England. He made his first-class debut in 1909, but didn't have much success until after the War, and he gained England selection in 1921. Despite his success, he never cemented an England spot. I don't know why. This is the New Zealander John Reid from the 1980's, not the New Zealander John Reid from the 50's and 60's. His first five seasons of first-class cricket for Auckland went between the OK (37,14 in 76/7) to the poor (23,94 in 77/8), but he did very well in the 1980's until a form slump in 85/6 before his retirement. Catterall was a regular part of the South African team for much of the 1920's. He saved his best for Test matches — for South African sides in tour games he averaged only 25,16. He had a stint with Natal in the middle of the decade, and for for them his record was similar to his international one (36,09 for Natal). But for Transvaal, where he played most of his domestic cricket, he averaged only 31,71. Watkins made his first-class debut for Glamorgan in 1939, and so the early part of his career was interrupted by World War II. In 1946 he struggled to establish himself in the Glamorgan side, but in 1947 he had more success, averaging 33,5. It was in 1948 that he made his international debut, after transforming himself into a successful all-rounder. The start of Watkins' England career was inauspicious, with scores of 0, 2, 9, 4, and 7 before he made double-figures. Thereafter he had more success, almost exclusively overseas. His bowling was not up to Test standard, though, and unable to hold his place as a specialist batsman, he played his last Test in 1952. He continued to play as an all-rounder for his county until the early 1960's. Trescothick made his England debut in coloured clothing, and such was his success that he was picked for the Test team soon afterwards, despite his very mediocre County Championship record. He's done pretty well for himself, despite still averaging less than 35 in first-class matches for Somerset. Shoaib Malik's career is certainly an unusual one — he started his career as an off-spinner, before suddenly showing everyone that he could bat. It's just as well he did so, because his bowling action is dubious. He just didn't bat as well for Somerset as he did for England. Bland is best-remembered as one of the greatest fieldsmen of all time, but he was more than handy with the bat. Stuart has written a detailed profile of him. His international career ended with a knee injury, and though he continued to play first-class cricket, his batting from the 1968/9 season was inconsistent. His Test average is bloated, with half of his Tests to date against Bangladesh. In my post below on modified batting averages, Vandort was the batsman with the biggest decrease when taking into account the strength of the opposition attack. After his conversion to Islam, Yousuf has had tremendous success at Test level. During his Test career he hasn't played much first-class cricket. His ratio of Test runs to other first-class runs (2,97) is the highest of any Test cricketer with at least 20 Test innings. He also has the highest ratio of number of Tests to number of other first-class matches. Barrington played seven seasons of first-class cricket, during which time he averaged only 33, before becoming one of the best batsmen in cricket history. Even so, his record for Surrey is remarkably poor, compared to what he did for England. I estimate (I can't be bothered working it out precisely) that he averaged under 50 for his county even ignoring his formative years. You'd think that an average of over 54 would keep you in the Test team for more than just 15 Tests, but you'd be wrong in Davis's case. He started his first-class career for Trinidad (and then Trinidad and Tobago) very well, averaging over 60 after five matches. Then his form tailed off for a few seasons before a return to form in 1967/8, which led to his selection for the West Indies. He was another player who just played better in Tests — for West Indians, he averaged only 32,34. Sharpe, like Bland, is best remembered for his fielding. He didn't do much wrong in England colours, but he was dropped in favour of Geoffrey Boycott in 1964, and in 1970 he and Mike Denness were replaced by Brian Luckhurst and Colin Cowdrey. Probably his poor county form counted against him. For Yorkshire in 1965 and 1966 he averaged just 22,72 and 22,45 respectively. Jackson made his first-class debut in 1890, and played precisely half of his Tests in the 19th century and half in the 20th. His Test record is quite extraordinary for the time, as suggested in my post below on modified batting averages. He was also a more-than-useful bowler, taking 774 first-class wickets at 20,37. Paynter's career was remarkably topsy-turvy, which goes some way to explaining why he's not remembered as much as his Test average would recommend he should be. In his first-class seasons before 1932, he averaged less than 30. Then, after doing well in the Bodyline series, he went back to county mediocrity, always scoring a thousand runs but never at a great average. In 1937 his international career resumed, and perhaps he would be more famous if the Second World War hadn't happened. This is not much of a surprise. When not keeping wickets for Sri Lanka, his batting has been tremendous. He is not too far behind Mohammad Yousuf on the list of cricketers with the highest ratio of Test runs to other first-class runs. His Test average is bloated somewhat by minnow matches, but it's still much higher than his average in other first-class games. I'm sure you all guessed this one. My numbers here are already out of date, as his Test average has dropped below 83 with his dismissal against India today. Cricinfo have launched a new version of Statsguru, which allows you to list all (Test, ODI, T20I) players in order of all sorts of things, by many filters. It's really good. For example, this is a list of the opening batsmen with the lowest batting average in Tests that the batsman's team has won (qual. 20 innings). The only extra feature that I'd like to see would be an ability to exclude teams from the analysis (e.g., Tests not involving Zimbabwe and not involving Bangladesh). The new version is still in beta and they're accepting suggestions, but my ISP doesn't let me send anything (because there's a ":8000" in the URL somewhere), so if someone could make this suggestion for me, that'd be great. Over at the Cricket Fans' Forum I saw this article, which describes some of the work of two economists, who have come up with a way of adjusting the batting average to take into account the consistency of the batsman and the importance of his scores in each individual innings. I don't think that the former adjustment is warranted at all. The latter adjustment has some merit, but I'm not convinced about it — a good batsman in a weak team would be unduly rewarded, and vice versa. One modification to the batting average that does make sense is an adjustment for the bowling strength of the opposition. I've implemented this in a pretty simple way. 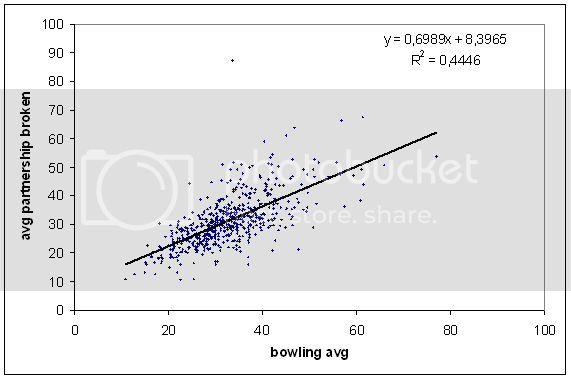 For a given batsman's innings, I weight the runs scored by a average of the bowlers' bowling averages, where this latter average is weighted by how much each bowler bowled. Perhaps an example would be useful. Suppose that a batsman from Team A scores 100, and in that innings Team B used three bowlers. Bowler A, whose bowling average is 25, bowled 20 overs. Bowler B, whose average is 25, bowled 10 overs. Bowler C, whose average is 30, also bowled 10 overs. The weighted bowling average would then be 0,5*20 + 0,25*25 + 0,25*30 = 23,75. This is similar in spirit to the modified bowling averages below, though somewhat less elegant — you'd expect that a captain would often give the most overs to whoever happens to be bowling the best that day, regardless of what his career average is. Still, it's a relatively simple idea and it seems pretty fair. Most of the usual suspects at the top of the list take quite a hit, with Headley and Walcott the two exceptions. The biggest major falls are from Eddie Paynter and Wally Hammond, who come in 36th (47,27) and 37th (46,86) respectively. Stanley Jackson leads the charge of the 19th century brigade (though he also played in the early 20th century). Allan Steel, who played all of his Tests in the 1880's, has one of the biggest increases, going from 35,29 to 48,92. Steel is also pretty cool because he made nice round numbers: 600 Test runs, and 7000 first-class runs. Some other notables (usual average in brackets): JJ Lyons 44,37 (27,07); WG Grace 42,91 (32,29); Arthur Shrewsbury 46,32 (35,47); Victor Trumper 41,73 (39,05); Chris Martin 1,97 (2,00). Feel free to request any others. England were really really bad today. In the ongoing Test at Galle, Sri Lanka declared their first innings at 8/499, and England replied with just 81. The ratio of the larger innings to the smaller is 6,16. This is one of the largest in Test history. Of this top twelve, three involved Bangladesh (including two from their recent three-Test series in Sri Lanka — what are they doing playing series of three Tests? ), one Zimbabwe when they should have already had their Test status revoked/suspended, and one is from the 1888/9 series in South Africa, which Charles Davis describes thus: "Of all the 1,800+ official Test matches, this match is probably the one least worthy of Test status." If you ignore the minnow Test-playing nations, England's performance today was the second-worst by this measure since 1950. The team with the highest ratio lead on first innings but who still lost the Test was South Africa, playing against Australia in the third Test of the 1950/1 series in Durban. South Africa won the toss and batted, making 311. Australia replied with just 75, giving a ratio of first innings scores of 4,15. South Africa batted again, and collapsed from 2/85 to 99 all out. Australia had to chase 336, and they fell to 4/95. Neil Harvey then played one of the great fourth-innings innings, scoring 151 not out to lead Australia to victory with the loss of only one further wicket. At the time it was the second largest successful run chase in Test cricket, behind the Invincibles' 3/404. I like to watch cricket. In particular, on any given day I want as much cricket as possible (unless Australia are trying to save a draw, in which case I am happy for it to rain). As a direct consequence of this, I don't like slow over rates. Slow over rates are a blight on the modern game. I get really annoyed at teams ambling through 13 overs an hour, and not getting close to 90 overs by the compulsory stumps half an hour after the scheduled stumps time. Some people blame the TV networks for depriving them of the extra bit of cricket, but to me the blame lies squarely with the bowling team. It never used to be so, as you will see in the graph below. I've taken all Test innings of at least 120 legal balls for which I have minutes data, calculated the over rate (converting to six-ball overs if necessary), and plotted this against the calendar year of the Test. The decline in over rates is striking, though we can be thankful for the small mercy that it seems to have bottomed out in the last 20odd years. Before 1954, there was never an innings in which the over rate was less than 15 per hour. (Well, it's possible that there might have been and I just don't have the time data for it, but this timescale is at least fairly accurate.) 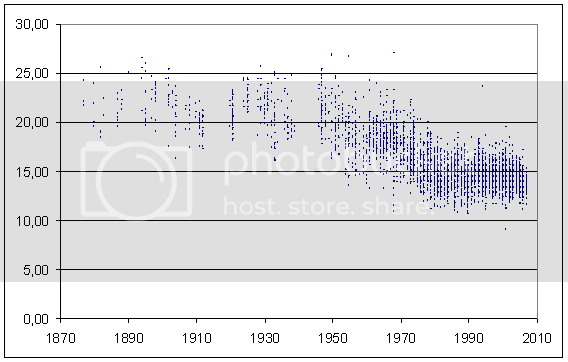 England was the first team to dip under the 15 mark (and indeed bowled the first six such innings), but it's not fair to single them out - the trend had already started a year after the end of the War. Those last two innings are the only times the over rate has been 20 or above since 1980. That Test number 42 you see up there is one of the greatest of all time: it is the Sydney Test that saw Australia lose after enforcing the follow-on. The first match on that list is the first Test between Australia and the West Indies in 1968. At stumps day 3, the Windies were 7/298. Australia took 73 minutes to take the remaining three wickets on day four, and ended up chasing 366. The West Indies attack, led by Sobers (33.6-12-73-6), then dismissed Australia in 88.6 eight-ball overs, bowled in less than four and a half hours! The Test didn't need to go into the fifth day. At the other extreme we have England's un-effort on a rainy day to lose the Ashes in 2001. The latter innings is the one with the slowest over rate with at least 540 balls bowled (i.e., 90 six-ball overs). You might be wondering about the asterisk and "anomalous data" up in the first table. To calculate innings times, I re-constructed the innings partnership by partnership, finding the length of time for each. An easier way to calculate it (when there is data for every batsman) is to sum up all the batsmen's minutes and divide by 2. Usually, these agree pretty closely, but for a handful of innings (about 40 or 50), the difference is over 15 minutes. Edit: It's probably worth pointing out that although I have presented the over rates above to two decimal places, the second decimal place is probably not significant, beause most of the total innings times are only sure to within a few minutes. I decided that I could use this area to store my cricket statistics posts. I will still post them to LJ, but I will also post them here. Some of the old posts aren't displaying so well in Blogger. Martin said that he'd like to see a bowling average in which each wicket is weighted by the batting average of the batsman dismissed. I have now calculated these averages for all bowlers who have taken 50 or more Test wickets. The figures are current to Test 1847, the second Test between South Africa and New Zealand. It is interesting that this one weighting factor appears to even out bowling averages across eras remarkably well. The top of the list of lowest bowling averages is dominated by players from the 1800's. But weighting by the average of the batsman dismissed largely cancels out the effect of low scoring, because the batsmen have low batting averages. Note that I've used the batsmen's career averages, rather than averages at the time of dismissal. This, while making my calculations easier, has the unfortunate side-effect that a bowler's adjusted average can change even when he's not playing. Here is a table showing the top twenty bowlers, according to this adjusted average. The columns of the table are matches, runs conceded, wickets taken, usual average, adjusted wickets, adjusted average. If I am generous to me and Martin, I could impose a 100-wicket threshold, and note that SF Barnes comes out number one, as he should. I would treat these figures as interesting and not, of course, take them as the be-all and end-all. You probably want to know about Murali and Warne. Murali comes in at #30, with an adjusted average of 24,53. Warne is at #74, with an adjusted average of 28,05. There are a number of ways this analysis could be taken further, but I will save myself the trouble and simply link to Charles Davis (see the table at the bottom and discussion just above).